Maintain peak performance of equipment with the Broadhead Arrow Sharpener with Wrench from Lansky. Lansky has crafted the perfect sharpener to pack for hunting or tactical missions because of its compact design and all-around utility. Touch up knives or sharpen broadheads to a precision point. The sharpener also locks broadheads in a safe position for replacement or tightening. The low-V tungsten carbide head sharpens close to the blade tip. 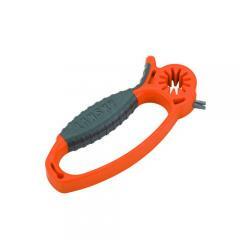 Its universal wrench works safely and conveniently with 3-, 4- and 5-bladed broadheads. The tool features an over-molded rubber grip that delivers non-slip comfort.